Agricultural fields in the middle Shira River basin play an important role as a source of groundwater recharge; however, the water balance between the agricultural water and river water is unclear. This study was conducted to investigate the water balance in the fields by measuring the stream flow of agricultural water channels, which draw water from the Shira River. The flow rate of water channels was found to increase in the beginning of May, which corresponded to the cultivation of paddy rice fields. During summer, the total agricultural intake was comparable to the river flow observed in the middle Shira River Basin. Determination of the water budget for the targeted area revealed that most of the recharged water was dependent on agricultural irrigation from the river. The annual recharge of the overall target area was estimated to be as high as 15,300 mm. In addition, the infiltration rate was as high as 170 mm/day in the paddy fields during summer, and as high as 30 mm/day in the upland fields during winter. In order to recover the groundwater recharge in this region, it is necessary to extend the submerged period to include periods in which the stream water in the Shira River is not subject to heavy rainfall as well. This study was supported by a grant from the Center for Politics Study, Kumamoto University. 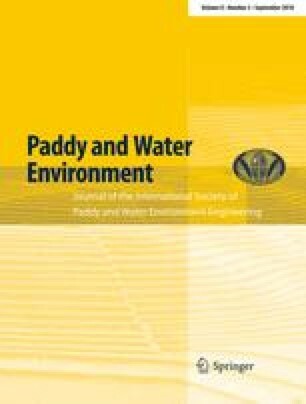 The authors also thank Mr. Hirano of the Sea-Bass Planning Co. Ltd. for providing the flow measurement data for the water channels.